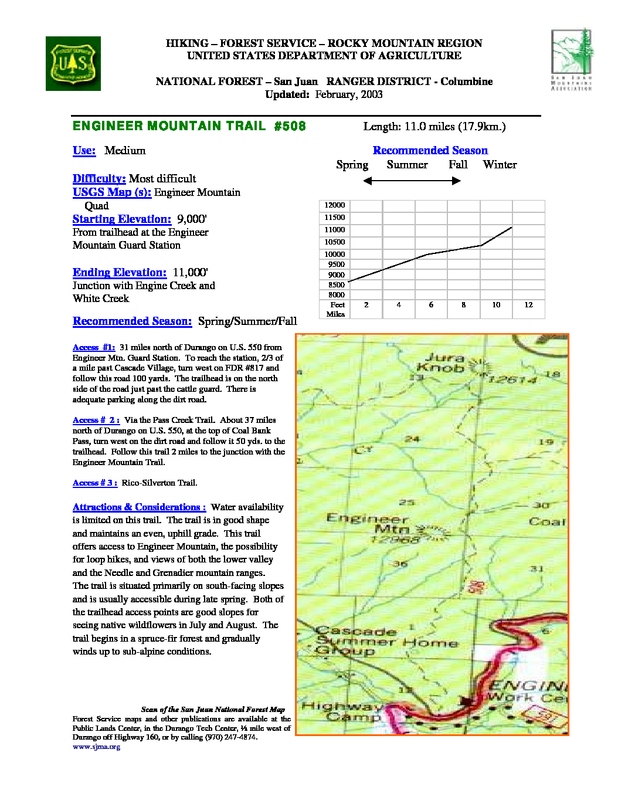 Engineer Mountain Trail #508 is a 9.18 mile one way hike with 3,686 feet accumulated elevation gain. Located 27 miles north of Durango Colorado. July and August are the best months to enjoy this hike. Water availability is limited on this trail. The trail is in good shape and maintains an even, uphill grade. This trail offers access to Engineer Mountain, the possibility for loop hikes, and views of both the lower valley and the Needle and Grenadier mountain ranges. The trail is situated primarily on south-facing slopes and is usually accessible during late spring. Both of the trailhead access points are good slopes for seeing native wildflowers in July and August. The trail begins in a spruce-fir forest and gradually winds up to sub-alpine conditions.